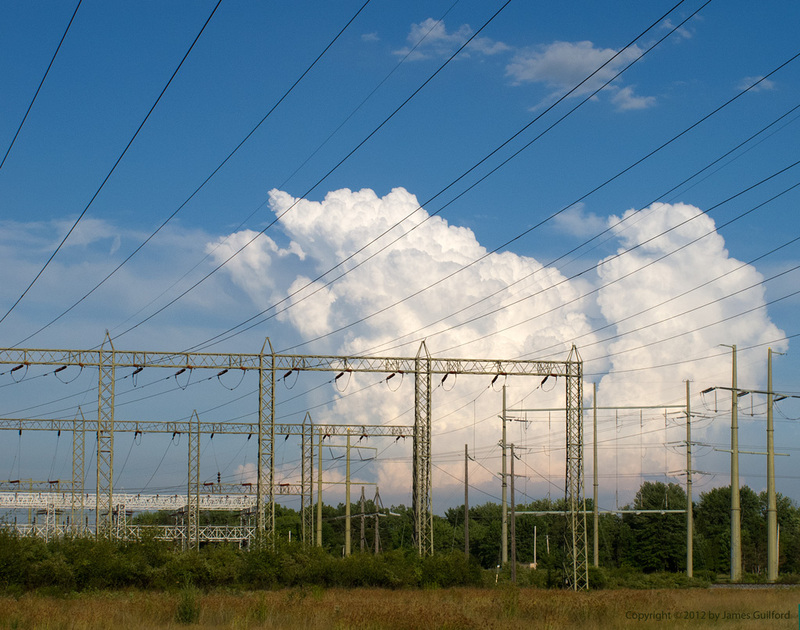 Cumulus clouds over electrical substation. It was not storm chasing but my drive this evening certainly was interesting. Lately conditions have been ripe for cumulus clouds to billow up in the late afternoon; contrasted against a clear, blue sky they make dramatic scenes. Last night’s billowing took on the appearance of a pair of clouds that needed a brassiere! I’m not kidding! Sorry, though, I couldn’t get a photo of that! Sometimes you just can’t find a place to get >>that<< shot and it gets away. During tonight’s drive, however, I watched as a column of cloud gradually built up, then flare out. Nearly frustrated in my efforts to get to safe and good vantage points, the cloud stayed together just long enough for me to catch it at a couple of stages. The first open space with a good view was at an electrical substation. I actually like the shot of all those lines and towers crossing the building clouds. Across the highway, over the barrier, above the trees. Next came a stop along the freeway. Looking across the asphalt canyon and over the “sound barrier” and trees beyond, I could see that the top of the cloud column was being flattened out; strong winds must be at work. 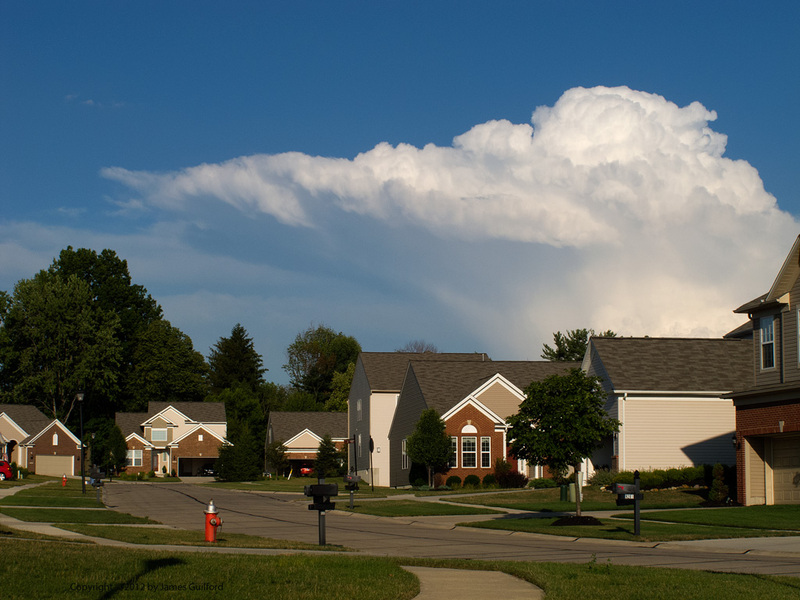 Was this a thunderhead or anvil cloud forming? Briefly, as I continued my drive, I saw lenticular shapes develop, then quickly disappear at the windward end of the column. Towering and spreading over a modern subdivision. Another opportunity presented itself in a subdivision. By then the cloud had really spread out to the north. I like the way the enormous billowy shape towers over and threatens to engulf the pretty houses below! 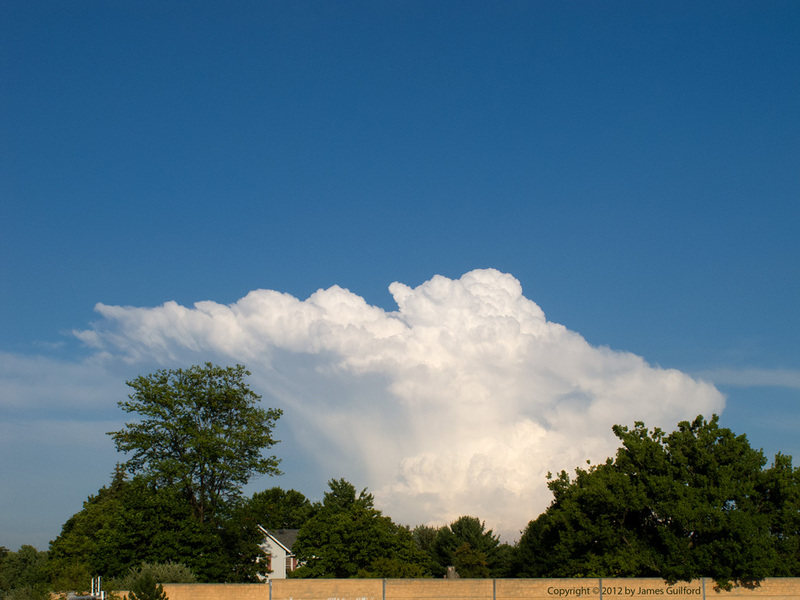 I continued my drive, watching traffic and glancing at the mushrooming cloud. By the time I reached another open space, the shape was feathering out. No storm was born. No longer of interest. Not storm chasing but It was a most interesting drive.